Meet Christen Anderson of Live Christen Joy. Each month, she will answer a home design question posed by one of our readers. This month, learn about how to make a beautiful bedroom. Meet Christen Anderson of Live Christen Joy. Each month, she will answer a home design question posed by one of our readers. Anderson is a Minnesota native with an eye for decor and design. Christen Joy is known for exceptional remodels, expert staging and accessorizing high-end living spaces. Anderson is also a passionate art collector, world traveler and home cook who frequently entertains for friends. Answer: I love a spring refresh and after our long winter, we all deserve it! There are several questions that come up when starting to shop for the place that you spend quite a bit of time in, that being your bed. It must be a place you look forward to curling up in and furniture pieces that you’re proud of when new guests are given a house tour. I recently worked with a mother and daughter to design their new condo and had the pleasure of selecting all the items for their bedrooms. 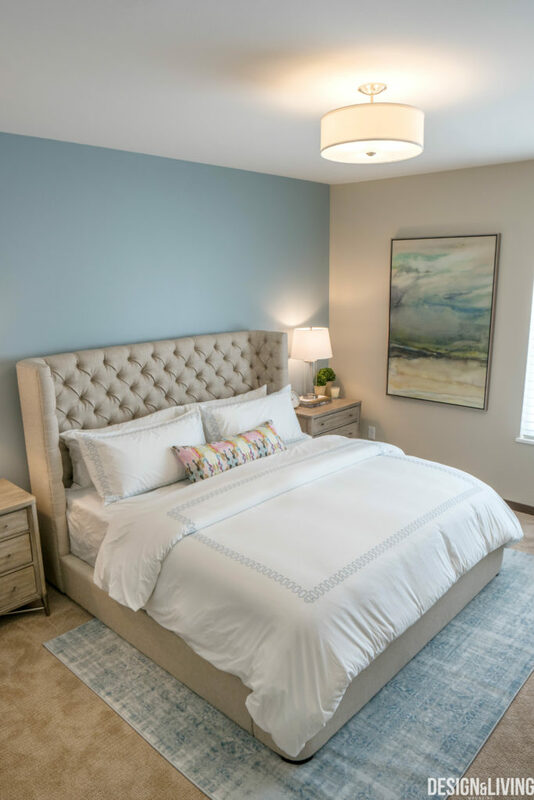 Let me give you a tour of the completed bedrooms and give you an overview of where you can start making the space you’re dreaming about a reality. The number one question asked about sheets is, “How do I know what thread count to get?” Sheets are more than just a thread count, so before you pick out a number, consider thinking about this first: figure out the type of fabric that feels great on your skin (woven cotton, polyester, jersey, microfiber, etc.) and start to look for brands that are known for their fabric quality. Now move on to thread count. Good sheets range anywhere from 200-800 and can go up all the way up to over 1,000. Though note, there are ways to increase the thread count without a higher quality product. Studies have shown that buyers find thread counts from 300-400 to be ideal – this goes with saying, you must complete the first step of finding an ideal fabric for you and one high in quality. For the condo, I went with tried and true bedding; can’t fail brands that my guests ask about every morning after they have enjoyed an amazing night’s sleep. Sheets, check! Second item to consider are pillows, shams and the variety of shapes they come in. Your most common types of pillows and shams used in the bedroom are: Euro, Standard, Square and Bolsters. For the condo, I wanted to have pillows that have high functionality and are not just décor-oriented. With this in mind, I purchased four pillows for each bed that could be used as they wished and kept the accent pillows minimal for each bed (one!). Before you leave the store or checkout online, add in a few personal touches that will make your space unique. You may be able to add in monogramming with a few quick clicks of a button; adding your initials, selecting a font and completing the look with your choice of color. This inexpensive detail takes your bedding to the next level. I added monogramed sheets and a duvet cover for the daughter’s room. It felt like the perfect touch for the Parisian-themed room, which was designed to include thoughtful and beautiful details, soft rosy pinks and furniture that is cute and girly. Now that your cart is full of delicious bedding, let’s talk about how to make the bed. When it comes to making your bed every morning, here is a quick go-to guide that should take two minutes or less – so hit the snooze button if you must and use this to start your day off in a great way. Once up and out of your bed, flip all but your fitted sheet to the end of the bed, pull each corner to tighten and tuck any extra material. Next, take your flat sheet (otherwise known as your top sheet) and evenly distribute on top of flat sheet. If you’re really in a bind with timing, leaving this untucked is no biggie. Next, take either your duvet, blanket, comforter or bed spread and, like the flat sheet, evenly distribute on top of said flat sheet. Once this is completed, take your flat sheet and duvet/blanket/comforter/bed spread, together, and flip them back roughly one-third the size of your mattress leaving the top third of your bed with the fitted sheet ‘exposed.’ Lastly, add your pillows. I prefer the pillow you sleep on be stacked against the headboard and then your additional, possibly fabric matching pillow sham, stacked in front of your everyday sleeping pillow. Complete the look with a fun throw pillow. Voila – quick, easy and beautiful! Now that we have the basics down, here’s an outline on things that I’d recommend when you have company over or have an extra four minutes in your morning. When it comes to your flat sheet (aka top sheet), do make sure that if it has a pattern on it, to place it pattern side down (this will look ‘inside-out’). This way, when you fold it over, the pattern will be there for all eyes to see. Since we’ll most likely be spending more time than our typical morning routine to make our bed, tucking your flat sheet is a must. To me, tucking your sheets gives your bed a much cleaner, overall look. I tend to always lean towards the ‘hospital corners’ method when I tuck my sheets. Here is that breakdown on how to do so: Start by tucking in the bottom edge of the flat sheet at the foot of the bed. Working from corner to corner, lift the bottom corner of the sheet up to make a 45-degree fold, then tuck the remaining sheet corner under the mattress. Drop the 45-degree fold down and pull smooth. Finish by tucking the remaining edges of your sheet into your bed frame or under your mattress. To dress up your duvet/blanket/comforter/bed spread, pull your flat sheet along with said item together half-way back then bring a quarter of the way forward towards the headboard. This will give the illusion of a very full and plush bed. Another helpful tip if you really want to achieve a full look would be adding in an additional comforter. Lastly, take a quick minute to wipe away wrinkles. Tugging in a downward and away motion will help leave a smooth surface. Helpful tip: Wrinkle Releaser by Downy saves a ton of time and is a no-hassle item with no cords or dribble of a steamer. Plus, getting it in a fresh spring or lavender scent will also help with a great night’s sleep! When layering your made bed, here is the order that I would stack and arrange said pillows: Euro pillows and shams are typically square and are your largest, so these would be situated in the back along the headboard. Placed directly in front of your Euro sham would be your standard pillow and sham, which are typically rectangular and firmer. Square pillows and bolster pillows, which are a cylinder shape, are your accent and decorative throw pillows. Place these in no specific order in front of your standard pillow. Finish your bedroom with ideal lighting, fresh flowers or greenery, your favorite scented candle, concealed cords for a clean look and, if you prefer, a white noise machine (instead of a fan). Now, snuggle up, sleep-in and enjoy your new refreshed space!